Since 2009, infrastructure financing to Africa has seen unprecedented growth. Chinese financing, official development financing (ODF), and private participation in infrastructure (PPI) investments have been key sources in this rapid growth—as have national African governments and their domestic resources. However, this financing is still not enough to reach the estimated $93 billion gap in the continent’s infrastructure needs. In addition, while infrastructure financing has seen massive growth, until now we didn’t have an understanding of what that growth looks like. Specifically, what countries and sectors still aren’t getting the attention they need? Is the current global governance on this financing sufficient? Where are efficiency and sustainability gaps? Is there a balance between regional, national, and sub-national infrastructure? In our recent paper, “Financing African infrastructure: Can the world deliver?” we explore these questions and identify five major trends in infrastructure financing in Africa. Trend 1: There has been a major surge in external financing in the last decade, but its composition looks much different now. By 2012, external financing commitments almost reached $30 billion—up from only $5 billion in 2003. However, as seen in Figure 1, while infrastructure commitments have been growing from all major sources, private investment has particularly been taking off. Indeed, PPI accounts for 50 percent of infrastructure financing. Chinese financing has also seen significant growth since 2002, and now accounts for about 20 percent of external financing. Importantly, ODF, PPI, and Chinese financing often (but not always) emphasize different sectors and target different countries—as we explore in the report—creating the need for a central actor to coordinate these disparate efforts. Trend 2: The importance of PPI and non-traditional sources has grown. Not only have the proportions of Chinese and private sector investments grown, but their significance for particular sectors on the continent has become increasingly important. In our report, among other interesting trends, we find that PPI is the major contributor to the telecom sector. In fact, 64.1 percent of PPI goes to telecommunications. Electricity sees 18.6 percent of PPI, seaports see 9.6 percent, and the last 7.6 percent is split between six other sectors. Clearly, PPI has grown and contributed significantly to African infrastructure, though it has been narrow in scope: As seen in Figure 2, excluding telecommunications, the number of countries receiving PPI drops from 40 to 21. This trend suggests the need for better-targeted measures to promote private investment for other sectors in a broader range of countries. Source: Authors’ calculations using World Bank PPIAF database. As seen in Figure 3, Chinese financing and PPI often cover sectors and sub-sectors that national governments and ODF do not. We find that Chinese infrastructure financing emphasizes transport (particularly railways and roads) and hydropower. Importantly, Chinese funding has significantly complemented ODF, PPI, and domestic financing in terms of both countries served and sectors supported—once again calling for good coordination and alignment of efforts throughout the continent. Trend 3: Traditional multilateral banks still remain relevant in certain sectors and sub-sectors. While PPI and Chinese financing have been growing, ODF still contributes a major share of infrastructure financing. As seen in Figure 4, ODF still plays a particularly important role in transport, and water supply and sanitation (which receives only 10 percent of external infrastructure financing on the continent) as well as in energy. In fact, financing to water supply and sanitation from Chinese financing and PPI is almost nonexistent. Another advantage of ODF is that, due to the criteria for multilateral concessional loans, allocation across countries is broadly distributed (which is not the case for PPI nor Chinese financing). In fact, for low-income fragile states, ODF is the largest source of external commitments (excluding telecom). Source: Authors’ calculations using OECD database. Trend 4: Overall external commitments as a share of GDP indicate a surprisingly reasonable distribution by country. As could be expected, large economies such as South Africa and Nigeria receive the largest absolute amounts of external financing. When controlling for the size of the economy, however, four of the top six recipients of external financing as a percentage of GDP are all low-income fragile states—Liberia, Togo, Malawi, and Sierra Leone—with Liberia standing out with more than 25 percent of its GDP. The lowest recipients of external financing (as a percentage of GDP) represent a variety of country types. For example, large economies such as South Africa and Nigeria rank near the bottom, as do resource-rich economies such as Angola, due to domestic resources and/or the size of the economy. In addition, many fragile states like Eritrea, South Sudan, the Republic of the Congo, and Chad rank in the bottom. Looking ahead, analysis of the strengths and weaknesses of middle-range countries (Senegal, Lesotho, the Democratic Republic of the Congo, Cameroon, and Côte d’Ivoire), might offer more opportunities for enhancing access to financing. 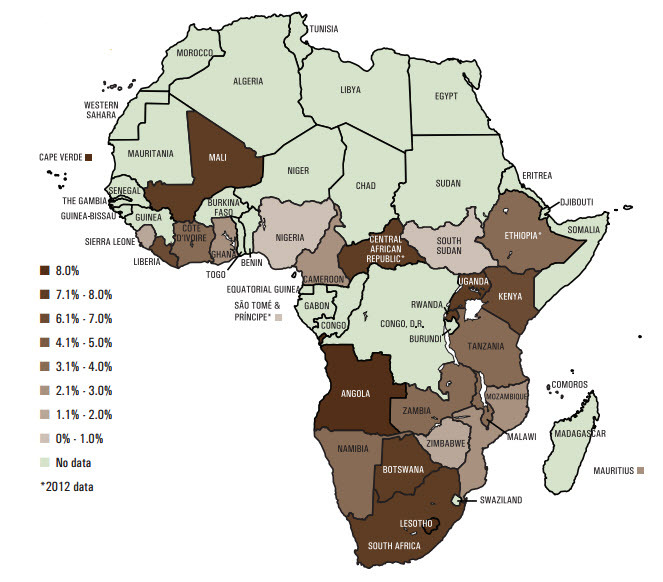 Trend 5: Domestic (budget) financing remains the largest source of African infrastructure financing. Unfortunately, these governments face many obstacles, including a lack of domestic revenues, a narrow base of revenues, and little capacity to collect those revenues. In addition, these governments have not yet been able to exploit what revenues they do have in an efficient way. Finally, a lack of strategy around infrastructure projects—including uneven financing among national and local, urban and rural projects—makes it difficult for them to get ahead of the game. When it comes to domestic financing for infrastructure, experts argue that 5-6 percent of GDP should be sufficient. As seen in Figure 5, while some countries do surpass this threshold (e.g., Angola, Botswana, the Central African Republic, etc. ), there is no rhyme or reason to who does and who doesn’t. Fragile states and resource-rich states fall all over the spectrum. By sector, like other sources, governments also fund transport and energy—at 41 percent and 37 percent, respectively, of their infrastructure financing. Water and telecom are on the other end, at 20 and 3 percent, respectively. However, these averages mask extreme differences across countries (see the report for more details). Sub-national/urban infrastructure—both in accessing needs and financing— is largely ignored, which, given rapid population growth and intense urbanization across the continent, raises some red flags. Until recently, the emphasis on facilitating projects has ignored governance, coordination, and efficiency gains in infrastructure, creating unnecessary and avoidable obstacles, and leaving great potential untapped. At the moment (as seen in Figure 3 above), the complementarity in financing across sources, countries, and sectors is purely serendipitous, creating the concern that, in the future, African infrastructure financing in certain sectors and countries will suffer major deficits. A coordination body is needed to ensure that financing will continue to address all needs. Traditional coordination mechanisms are ill-suited in the new economic environment with new and multiple stakeholders. Stakeholders need to consider new approaches to continue to raise new infrastructure financing as well as capitalize on current financing. Focus on broader sectoral governance reform opportunities. Fay, Toman, Benitez, and Csordas (2011).